ESPN has announced that USC Coach Pete Carroll will join the network as an analyst for SportsCenter and College GameDay from January 6-7. This of course is possible because of USC's lackluster season (9-4, 5-4 PAC 10) which ended in their 24-13 win over Boston College (8-5, 5-3) in the 2009 Emerald Bowl. The best quote in the press release is from Pete Carroll, who says "I'm not only looking forward to seeing this great matchup between Alabama and Texas, but joining with the ESPN crew to offer my thoughts and perspectives after having played in the BCS Championship Game in the Rose Bowl." Notice he does not say that he won the game, but that he "played" in the game. No Coach, you did not "play", you coached the game and lost the thriller to Texas. And it was not really called the BCS Championship game until the next year. The real perspective you bring is having lost to Oregon on the road and barely beating Ohio State. Oh wait, that's the Rose Bowl game tomorrow. So the question is, since Pete Caroll has never coached a USC game against Alabama, and lost to a very different Texas team in 2006, would not Florida coach-in-waiting Urban Meyer have been a better choice? Oh wait, he is on the DL. Nonetheless, here is the press release from ESPN. USC head coach Pete Carroll, who led the Trojans to seven consecutive Pac-10 titles and two National Championships, will join ESPN to provide analysis about the Citi BCS National Championship on the network’s SportsCenter and College GameDay Built by The Home Depot Jan. 6-7. Carroll will offer his insight on the pressure of playing in a National Championship Game and at the Rose Bowl, as well as coaching against Texas coach Mack Brown in the 2006 National Championship game. 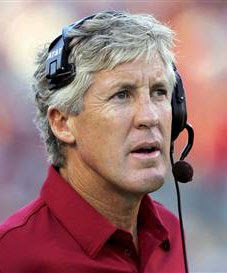 Carroll joined USC in 2001 and holds a 97-19 record (83.6%), second highest among active coaches with more than five years at the position. Carroll will appear on the ESPN set at the Rose Bowl in Pasadena on the evening editions of SportsCenter Wednesday, Jan. 6; a special one-hour College GameDay Thursday, Jan. 7 at 7 p.m.; National Championship pre-game and halftime shows on ABC beginning at 8 p.m.; and for ESPN’s SportsCenter post-game coverage following the game. “Coach Carroll’s experience in games of this magnitude will provide fans with invaluable insight on the thoughts going through the mind of a coach and the preparation involved to be in a position to win, adding a new element in the analysis of the matchup,” said Norby Williamson, ESPN executive vice president, production. Carroll added, "I'm not only looking forward to seeing this great matchup between Alabama and Texas, but joining with the ESPN crew to offer my thoughts and perspectives after having played in the BCS Championship Game in the Rose Bowl." Carroll just completed his ninth year as the USC head coach with a 24-13 victory over Boston College in the Emerald Bowl. From 2002-08, Carroll led his teams to an unprecedented seven consecutive Pac-10 titles, appeared in a record seven straight BCS Bowls and recorded at least 11 victories in each of those seasons. He is 7-2 in bowl games, including 6-1 in BCS games, with the only loss coming to Texas in the 2006 National Championship game at the Rose Bowl. Under Carroll, USC was the Associated Press's No. 1 team for a national-record 33 straight polls (including two pre-season polls) and was ranked in the Associated Press Top 10 for a school-record 63 consecutive games. His teams were ranked in the Associated Press Top 25 for a school record 102 consecutive games. In addition, during Carroll’s tenure, USC became the first school to have three Heisman Trophy winners in a four-year span.